I simply love the little snowman! Snowflakes are falling, temperatures are freezing. These days Mr Snowman is a popular figure in many places – a delight for all, young and old alike. My son and daughter put him together with special care and oodles of love…God bless them both! 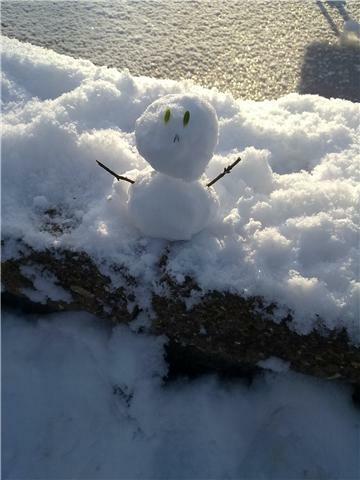 Awwww… that little snowman is so precious! What a wonderful photo. You should frame it, and remember this happy day every time you look at it. Here in New Jersey we are awaiting a nor’easter with snow. That would be horrible news but for your little snowman. If we get enough snow that will be the plan for tomorrow! Looks more like a snowbird dear Mal! :)) Tweet tweet! Hugs and kisses! That’s sweet, Maleeha. I enjoyed the Smiley blog–added much to my gen. knowledge. Hope you and saniya & faisal are doing well. BIG hug for the snowman, to you, and the two wonderful people who made him..
Aw, such a cute snowman. I’ll give him a nice cup of cold chocolate to keep him frosty. Aw, he’ll love that! Thanks, Duck.. 🙂 Happy New Year!